Within the chancel of the Soul! Seems hush’d in breathless reverence! Soft signs of unborn loveliness! The voiceless fairies of the flowers! ‘Snow-Music’ was published in The Athenæum (3 March, 1860, No. 1688, p.303). This is the first of the poems signed ‘B.’ in The Athenæum. Buchanan’s first reviews for The Athenæum were published in July, 1860. Buchanan’s first poems for Temple Bar’ commencing publication in December, 1860 were also initialled ‘B’. In June, 1862, The Athenæum published another poem by ‘B.’, ‘Sitting By The Sea.—June’, which was subsequently published in Buchanan’s Undertones as part of ‘Fine Weather By Baiae’, so I would suggest that it is reasonable to assign all the poems by ‘B.’ in The Athenæum from 1860 to 1862 to Robert Buchanan. Her strength was symbolized with swords! Whose slow progression leads to God! The fame of unforgotten deeds! Was Glory with a gentler name! Stabbed to the heart with honied words! ‘Italy, 1859-60’ was published in The Athenæum (31 March, 1860, No. 1692, p.442). But left the promise that it brought! The coming summer on its face! Yet all the fortune of the flower! The little end for which they lived. To die in its accomplishment. ‘The Crocus’ was published in The Athenæum (14 April, 1860, No. 1694, p.508). The shadows of the Rain. Bobbing as with a Soul! Meaning thro’ shades of Sleep! Are rainbow’d out from tears! Robe of the unborn May! ‘Rain’ was published in The Athenæum (26 May, 1860, No. 1700, p.719). A shorter, revised version of the poem was published in Wayside Posies (1866). The Farmer’s heart is dancing. Her blessings and their meaning. And a heaven here around us! Our gathered gems behind us. ‘Autumn’ was published in The Athenæum (20 October, 1860 - No. 1721, p.515). From whence it comes or whither goes? Their Souls are lilies grown in earth ! God sends the sunshine too! The climbing element of Time. As stainless as a star! Assists the motion on to truth. Apart from which it cannot be. The godhead of a duty done. With sacrifice for years to come. Is poorer for the doubt. ’Twill vindicate our lives from dust. Will help to dignify the Past. All ebb from one mysterious Heart. “... and there were contributions from two acknowledged poets, whose acquaintance I had recently made. One was Mortimer Collins, of whom I had heard frequently . . . In secret, judging William by herself. . . .
Once droops, he dies,—and so she loved him not. Younger than he, his cousin twice removed. The looks of little children when they ail. His playmate and his cousin twice removed. And kinged it o’er the anvil in his stead. Because the common liar called him hard. Was busy with its image night and morn. Meek as a lamb, but certain of her face. To make the maiden glad with wedding gifts. And heard the common liar call him hard. To which our sleep is nearer than we know. An amulet to frighten aims less clean. Because she loved him not, and deemed him hard. At last his passion trembled into words. Of old, were fond and friendly, Margaret. Not idle; and the love the greater help. In golden trances, waiting twilight tears. Was faded wholly out of hope and sight. She loved me not. ’Tis better: let her go. Approved the common tongue which called him hard. The mother in her, pity which meant love. Lies stretched where mourners weep not, far from home. Where grass and flowers are none, and Hope is dead. And save her, looking harder than of old. A straw afloat upon a sea of life. Their truce between the country and the town. The City sleeping in its thousand lights. Like little happy babes whose sleep is sound. But the mad search was void; he found her not. He sought his sorrow out, and found her not. In silence, looking harder than of old. God bless her! I will wrong her never more. They lied who drove me hither with their tongues. Unstained and clean, but foreign to his lips. Which faded wholly with the face he loved. Thinking no ill because he loved so well. Which erring Margaret Arnold left to spare. To take the common lie and credit it. But in the time of flowers a letter came. The name of some poor place where Margaret dwelt. Yet kiss me—comfort—all may yet be well. With many tears and kisses. And brought their faded hope to London town. My playmate, Margaret Arnold, your lost child. Yet strong in duty, looking hard and cold. The paper, writ in Margaret Arnold’s hand. Who loved me once, not idly. For use, and not for joy, not loving her. Between us. I have wronged you, but I die! He drew my footsteps from the path of peace. Because I thought you hard. A life blaspheming against womankind. I wronged you, William Garnett, but I die! “God bless her—we forgive her—it is well. Our shame, a sinner. But she sins no more. Is spat upon and tainted. Let her sleep. A sinner, in the heart of London town. And took a helpmeet, less for love than use. 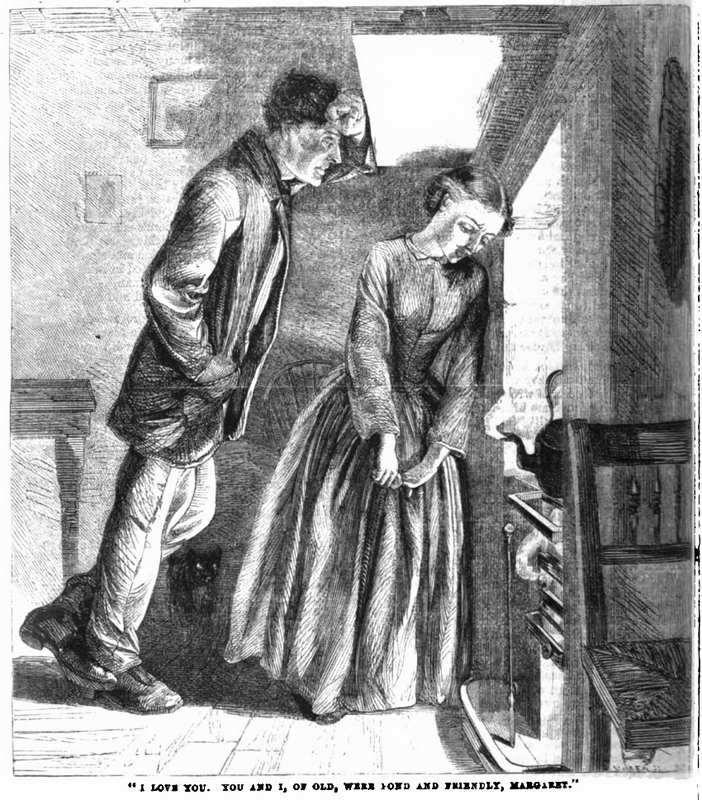 ‘The Country Curate’s Story’ was published in the Christmas edition of The Welcome Guest (December, 1860), as part of a linked series of tales, under the title ‘Snowbound’. And the stars, like their Souls, up in heaven! Of the sleep they are sleeping! City, so husht, as in fear! Asleep, with thy lives without number! The hopeful To-Morrow, called Beauty. Of the goal not yet won altogether? And thou keepest the dust as a token. A weakness his weakness will strengthen. And our Dead are our steps to perfection. Stands Labour transfigured and smiling. The types of a duty completed! The labour before us is meted. Hides hints of a beautiful meaning. Our toil is unconsciously making! When the Dead are the stones of God’s Altar! Them back from the portals of heaven. And talk of the absent faces! A name that is never spoken. To a chorus of drunken catches. Where the waters circle and seethe. Are smiled upon by the sun? To mock us and to undo us? These wandering daughters to us? With error, new-born of beauty. The village church in the summer. And purchased the girl a gown. With a slattern or a scold. While she sins and breaks their hearts. As she smiles on the babe at her breast! And richer in work divine! Whose is the sorrow and whose the sin? And how much of the sin is thine? We must labour to comprehend it. We are petty amid our scorn! And our little babes new-born! And the children that laugh in the sun! ’Outcasts’ was published in Temple Bar (No. 3, February 1861). And beacon their mothers from heaven. Are better, they say, in the dark. And he has leisure to pray. On the brink of a fathomless gloom. The light of Thy holier lives. To sweeten the bread which is given. For the light which is divine! With the rich white grain between. Not the light that has ripened the grain! Are shone upon by the sun. A threatening hand for bread. They gnaw at his outstretch’d hand! The poor ask only for bread! ‘The Destitute’ was published in Temple Bar (No. 4, March 1861).